The Postcode Grid Reference file provides an accurate grid reference for each of the 1.8 million Postcodes in the UK. The UK currently has over 1.8 million full postcodes (e.g. UB7 0EB) with each postcode representing on average fifteen sites (properties). Grid references defined by Ordnance Survey's CodePoint locate the Postcode to 1 meter accuracy of the first building within the Postcode. As Ordnance Survey only provide data for Great Britain (England, Scotland & Wales), X&Y Coordinates for Northern Ireland (Postcodes that begin with postcode area BT) are taken from Royal Mail's PostZon data file. 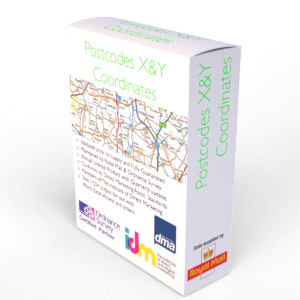 These PostZon X&Y Coordinates are only accurate to approximately one hundred meters and are therefore less accurate than the Postcode Grid Reference provided by Ordnance Survey's GB coordinates. The Postcode Grid Reference data is supplied as two separate CSV text files in order to allow opening and viewing of the data in Excel 2007 which overcomes earlier record size restrictions. The Postcode Grid Reference supplied in the file will never be more than three months old and the file comes with free updates throughout the licence period. When you order the Postcode Grid Reference file you will receive a text based list of over 1.8 million UK Postcodes with their appropriate OSGB grid reference and latitude/ longitude (WGS84) co-ordinates. The Postcode Grid Reference data is by default emailed at the time of order using a secure download link delivery method. If you require the data supplied in another format then we will be more than happy to accommodate you where reasonable to do so at no extra cost. The Postcode Grid Reference list is licensed annually for each user that has access to it.